Here are some Windows CE and Pocket PC applications that I've written that others should find useful. All of these applications are fully functional freeware. If you feel these applications are useful, consider making a donation. Just click on the donate button below to make a donation directly to me via PayPal in whatever amount you feel is appropriate. This is not necessary, but doing so will help me eat, and keep me developing future applications. Thank you. 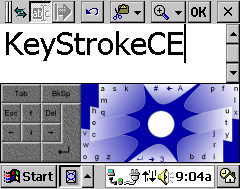 Key Stroke CE is a unique input panel I created from the ground up based off of a similiar design developed by the New York University Media Resarch Lab. Instructions on use, and installing it are included in the ZIP file. Please read the included readme files for information on how to change the list of icons, and how to upgrade from a previous version. Winner of the Survivor award as best task switcher application! 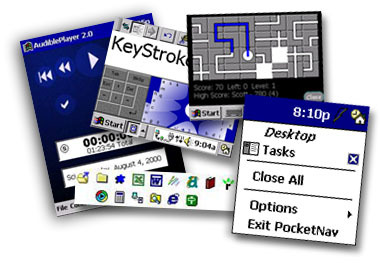 Pocket Nav is a Task Switcher for Windows CE and Pocket PC's. It allows you to close any program, and on the pocket pc's it also gives one tap access to the desktop at any point. Phyllis is a two player card game that you can play against your PocketPC. Visit my Phyllis page for more information. Gameplay information, and the installation executable are included in the ZIP file. 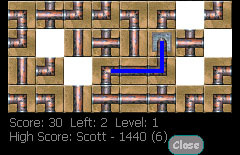 Puzzle Of Pipes is a cross between the classic game Pipe Dreams and those sliding picture puzzle games. You have to rearrange the peices before the water begins flowing! KeepAlive - Simulates keyboard activity to keep the system active (version 1.07). PowerOff - Adds an icon to the system tray to turn the unit off. Lines (PocketCandy version) - A lines type screen saver. ShowPictures (PocketCandy version) - Slideshow program that displays user provided images. Screen Off - Turns off the screen. Link to PocketCandy (external site), a screen saver launcher and more screen savers. Audible Skin Changer - Alter the appearance of Audible's Player. Clear Temp - Clears the Temp folder upon start-up. Do Nothing - An app that does nothing, to disable hardware buttons. Page Down App - Assign a program button to be a down arrow. Random Names - Gives a list of Random Names (for RPG's, etc).